For today, we decided to roam around area in central Bangkok. The first place that we went was Siam Center by BTS. Basically its a huge shopping complex with everything in it. We had our lunch there and then we walk our way to BTS again and stop at the very next station which is National Stadium. Actually, there’s a lot of interesting places around Siam Center and National Stadium and all are within walking distance. You can figure it out through the maps that is put at the train station. 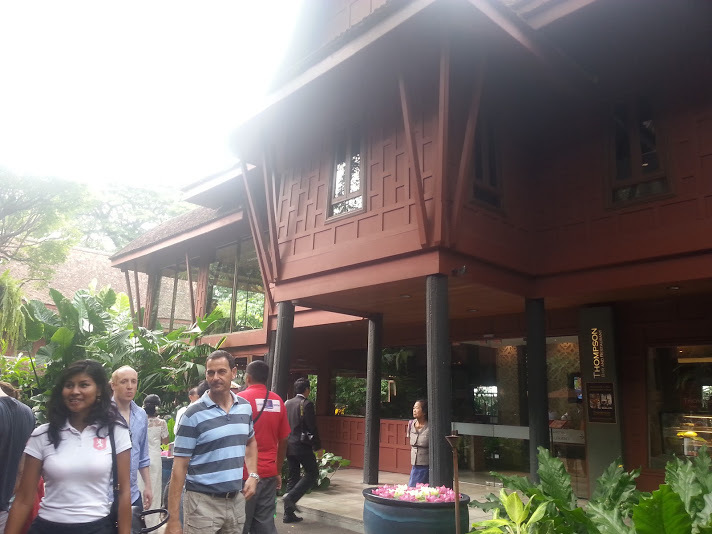 We made our way to Jim Thompson House museum from the BTS train station by walking. The Jim Thompson House is the home of James H.W. Thompson, a self-made American entrepreneur who was the founder of the world renowned Jim Thompson Thai Silk Company. Thompson’s achievements during his 25 year stay in the Kingdom of Thailand have won him much fame as the “Legendary American of Thailand”. He is actually a former US Army officer who had his working stints in Thailand and then fall in love with the culture. So once he retire from the service, he decide to come back to Thailand. The entrance fee for this is 50baht for student price and 100baht for normal visitors. We were provided with a tour guide who is proficient in English to explain us about every details about the place. The architecture of the buildings is pretty much the same like Malay house in Malaysia, which reminds me of my own house in village before it was renovated. 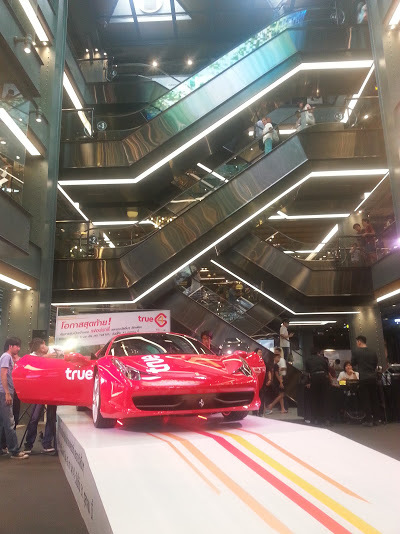 After that, we walked about 500 metres and reached the Bangkok Art & Gallery Center. There was no entrance fee to enter this place. 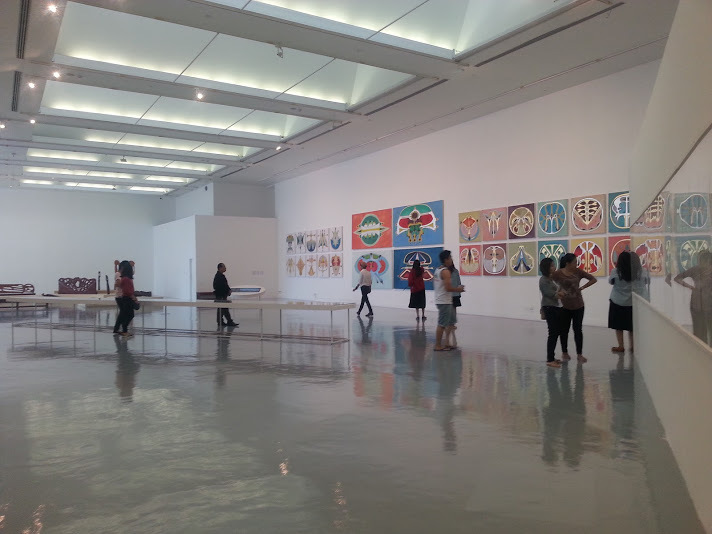 This gallery is huge and the way they decorate it is very stylish. This is the rendezvous of art industry in Thailand, be it painter, film-maker, comic artist etc. It has 7 floors and we actually went to every floor! haha. The coffee house here is pretty cool. 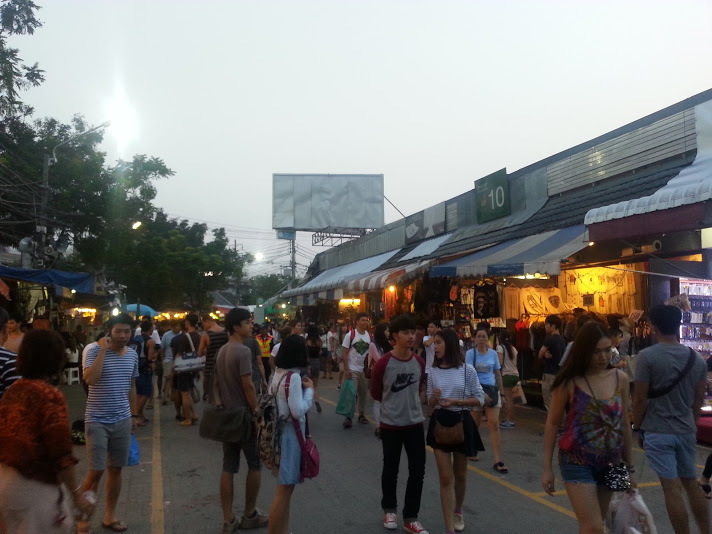 After we done exploring the art world at the gallery, we moved to our next stop which is the famous Chatuchak Weekend Market. This market is must-visit place for everyone who put their foot in this city. We reach there by BTS, which stops at Mo Chit station. From there we walked about 100 metres before we reach the market. U can find almost everything here. If U can haggle, please do so. But what I can see is the hawker here does not tolerate much, as the initial price quoted is already low. The size of the market is super duper freaking huge. For muslims, do not worry much about the food as there were a lot of muslims hawker here. I bought a couple of shirts and fridge magnet here. I even tried the fried grasshoppers for the first time ! A few interesting facts I encounter is at everyday at 6pm , the national song will be aired and everyone is obliged to stand still as a sign of respect, regardless of whatever you are doing at that time. A great way to foster patriotism indeed.